1 Double check your utility meter reading against your bill every month. If there is one thing you need to do, this is it. I found there were months my utility company estimated my energy use instead of reading the meter. They always estimated my use extremely high and charged me for it. It is a pain but taking the trouble to double check my meter reading has cut my utility bill almost in half. 3. Seal any and all air leaks in your home around your doors and windows. This was my biggest DIY during our Project and a cheap one at that. Insulate indoor outlets and switched on your outside walls and to an attached unheated garage (if applicable) with outlet and switch plate insulating sealing gaskets. You can go one better and add child proof electrical protector safety caps on drafty outlets although it can be a little bit of a pain to put them on frequently used outlets. Check gaps around outdoor outlets, faucets etc. and caulk if needed. If you can’t replace your drafty windows consider using a window insulation kit on all of your windows. I had these on all of the windows in my first apartment because when the wind blew the windows were so leaky the frame rattled! Add an insulating outdoor faucet cover on your outdoor faucets. Check if the garage door leaks. This is one of the most overlooked areas of detecting and sealing air leaks in the home. Look for gaps around pipes and wires, foundation seals, and mail slots in exterior walls. Under my kitchen sink was the worst one! 5. Close the dampener on unused fireplaces and consider sealing it further with a chimney balloon blocker with it is not in use. 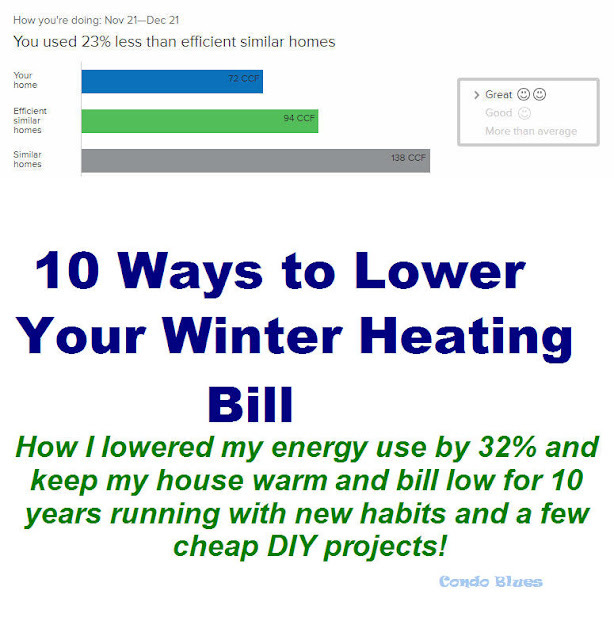 6 Install a programmable thermostat and use it! This is the secret to our success and it is pretty darn painless even though we telecommute. It is also the number one suggestion people reject with a ton of excuses. I suggest buying a preprogrammed programmable thermostat like mine because it is easy to change the program to suit your tastes. We changed the program to 72 in the morning, 68 during the workday (our office is upstairs when it is warmer,) 74 in evening, 65 when we are sleeping. If your family’s schedule varies, consider a Nest learning thermostat. 7. Shut doors to unoccupied rooms. This keeps the heat in the room and not floating out into the colder hallway or into unheated utility room. 8. Put an extra blanket and flannel sheets on your bed and dress in layers and for the weather. Yes, I realize it’s a thing that some people wear shorts in the snow but I can’t help you lower your bill if you insist on heating your house accordingly. 9. Open south facing drapes to heat a room although this may conflict if you have leaky windows. I was surprised how well this works even on gray days in overcast Ohio! 10. Check your attic insulation and add to it if possible. Before adding more wall insulation, check if your house is wrapped in vapor barrier first (also called by the brand name Tyvek.) This might be a less expensive option than reinsulating your house. 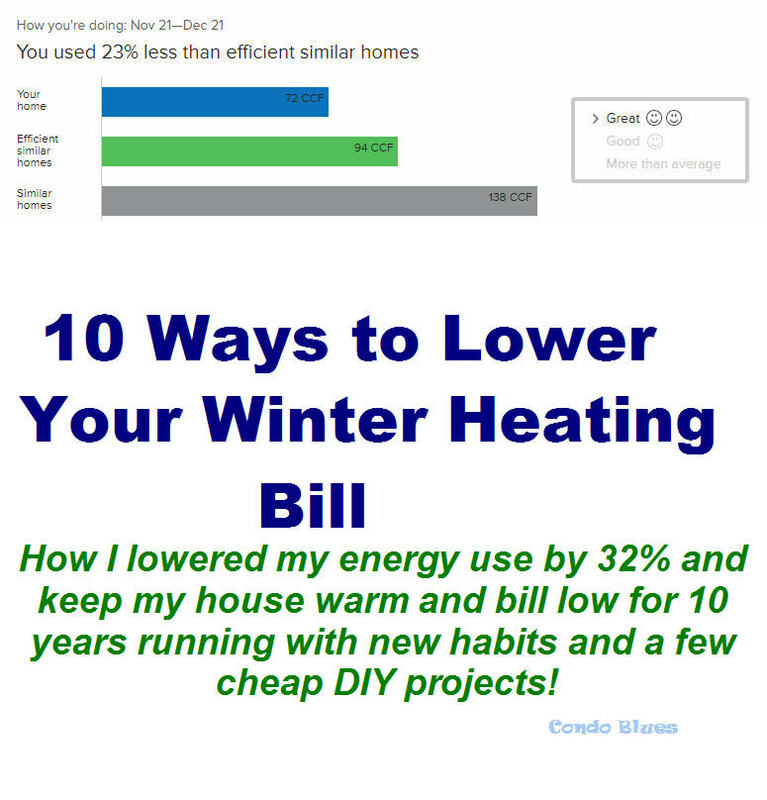 What do you do to keep your house warm and heat bill low?